Simply tapping on the tree in the screen, you can get golden coins. More golden coins you collected, the fast you can get richer. How fast you can tap/swipe? How rich you can be? 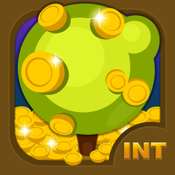 Tap: Tap on the tree to get golden coins. Invest municipal projects: you can get golden coins even quit the app. And there’s more ways to help you collecting golden coins even more easier: double finger tapping, swiping on the screen, shaking the phone, etc. There’s no wrong to pursue more money and don’t be shy of showing how rich you have been to your friends. But watch out, some bad people will appear to make you lose money: thieves, robbers. only rich people can help you with your wealth’s growth. So just tap,tap,tap,tap,tap,tap,tap,tap,tap,tap,tap,tap,tap,tap,tap,tap,tap,tap,tap,tap,tap,tap,tap,tap,tap,tap,tap,tap,tap,tap,tap,tap,tap,tap,tap,tap,tap,swipe,swipe,swipe,swipe,swipe,swipe,swipe,swipe,swipe,swipe,swipe,swipe,swipe,swipe,swipe,swipe,swipe,swipe,swipe,swipe,swipe,swipe,swipe,swipe,swipe,swipe,swipe,swipe,swipe,swipe,swipe,swipe,swipe,swipe,swipe,swipe,swipe,swipe,swipe,swipe,swipe,swipe,shake,shake,shake,shake,shake,shake,shake,shake,shake,shake,shake,shake,shake,shake,shake,shake,shake,shake,shake,shake,shake,shake,shake,shake,shake,shake,shake,shake,shake,shake,shake,shake,shake to make yourself a greater greater fortune.